The inner harbour of Vancouver British Columbia - considered one of the best deepwater ports in the world - has also become over the past 20 years, an important Pacific Northwest terminus for commercial sea/float plane and helicopter activity. According to the latest stats, the year 200O saw some 60,000 landings and take-offs in the harbour, comprising mostly commercial and scheduled traffic carrying thousands of passengers and cargo, ranking this the fifth busiest airport in British Columbia. Approximately sixty percent of the movements are float/seaplanes and forty percent helicopters. Although the "High season," May through September, posts the higher movement numbers, especially with charters, regular passenger and cargo flights continue to coastal communities, the Gulf Islands, and Vancouver Island through the rest of the year, including the poor weather winter months. "The Vancouver air harbour is unique and fascinating. It ranks as 5th busiest airport in British Columbia." Its own Control Tower: As with all active flyways, rules and good conduct are essential to safety, order and efficiency. NAV Canada, the privatized spin off from the previous governing authority, Transport Canada, oversees and controls all aircraft activity about the harbour and surrounding airspace within a box like zone of roughly 3 square miles. A fully equipped control tower sits aloft the 29th floor of the Granville Square office complex from which tower staff have an excellent and commanding view of the entire harbour, English Bay, and the majestic 'North Shore' mountains. An impressive panorama, especially in good weather, from which to conduct the business of air operations. Not at all hard to take. The "Navcan" high-seaters might just be the envy of the northwest, if not the entire west coast, since as word has it, no other port enjoys the benefit of a 'sky' high control tower, in such splendid surroundings. Canda's Helicopter-based airline: Visual Flight Rules are the norm for arrivals and departures of the fixed wing and the helicopter flyers. Helijet Airways, however, also operates its fleet of Sikorskys on I.F.R. which gives them night and fool weather capability. In any even the tower people must be ever vigilant for hazards and the unexpected during their hours of operation - 7 a.m. to twilight. Sometimes quite a challenge, I am told, given the spectrum of water vessel traffic and additional air activities within the "Burrard Inlet' zone. In this regard traffic from the international, regional and local airports likewise share the delta airspace which contributes to frequent overflights - almost 34,000 last year - made up of commercial , recreational, vehicular traffic reporters, movie and aerial photo-ops, banner tows, sightseeing tours occasional fire tankers and periodic military visitors that all add variety to a full days work. All told, plenty of reasons for 'regulars' to keep the eyes sharp, ears on and attention to altitude, particularly for those incoming. Where to watch the action: As a spectator, one doesn't have to be partial to airplanes to admire the subtle beauty of a float plane inbound to settle safely in friendly water. Or on the outbound to feel the sounds of a Pratt 'n' Whitney under full power hitting the '"step" and "throat" positions just right to be gracefully lifted airborne. There is indeed something wondrous about it all, whether you be a watcher or simply a passerby. Viewing from any of the great vantage points around the Canada Place/ Pan Pacific Hotel complex and cruise ship facility, locals and tourists alike can easily kick back, relax and enjoy the sights and sounds of the harbour - especially so on warm sunny days. The west or 'Coal Harbour' side which includes the float/terminal docks is the more active or staging area for the colourful pontoon workhorses led by the venerable and seemingly indispensable DeHavilland Canada DHC-2 Beaver. Canada's Beaver aircraft: This rugged 450 H.P. nine cylinder 'half-ton flying pickup truck" was developed and originally 1,631 of the PandW Wasp Jr. Beavers, wheeled and float versions, civilian and military, were rolled off the production lines between 1948 and 1969. Today, of the remaining airworthy Beavers, word is that two-thirds of them operate somewhere between Seattle, Washington and Nome, Alaska. Cessna 180/185 Skywagons are also harbour regulars as are the sleek and reliable DHC-6 Twin Otters and the single DHC-3 turbo Otters. Amphibians such as the Grumman Goose are seldom seen since there is no particular dock or ramp facility for them on the waterfront. This is somewhat unfortunate but who knows what the future will bring, what with all the building activity happening along the Vancouver shores of Burrard Inlet. A diversified operation: To the east side of the Canada Place pier and adjacent to the Sea Bus terminus (a ferry system that connects into commuter rail) is a waterfront heliport and up the foreshore a bit are the passenger and cargo terminals of Helijet International Inc. Although the large float ramp primarily serves Helijet's regular scheduled Sikorsky fleet, the heliport also is frequently used by "choppers" of all types from sightseeing tours, corporations, government, the military search and rescue, air ambulance, and perhaps some tourists on occasion. 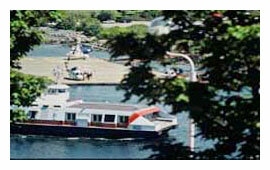 A busy place regardless, to the extent that this floating heliport is the busiest in Canada. And no shortage of interested onlookers - tourists, lunchers, excited wide-eyed kids, shutter-bugs, aviation buffs and the just curious. Even a static Sea King parked on the stern of a visiting Navy Frigate receives its share of attention. The Vancouver air harbour is unique and fascinating. But like all busy places, the end of a warm summers day often brings a welcome, peaceful calm to these inlet waters, disturbed only by the distant hum of a round engine, emanating from the silhouette of a Beaver Floatplane heading out over the lights on Lions Gate Bridge, before fading into a brilliant west coast sunset. Pretty hard to beat, even in Hawaii.